The Atari 5200 was introduced by Atari in 1982 as a replacement for the famous Atari 2600. It was mostly created to compete with Mattel's new Intellivision and with the ColecoVision shortly after its release. It can be argued that the 5200 was technologically superior and more cost efficient than both of its competitors, but a number of design flaws halted the system's success, leading many to the conclusion that the 5200 was a failure. 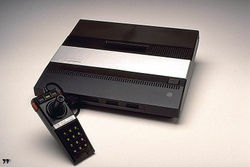 In its prototype stage, the Atari 5200 was originally called the "Atari Video System X (Advanced Video Computer System)", and was codenamed "Pam" after a female employee at Atari (many other Atari systems follow this naming system too). The 5200 was basically an Atari 400 computer without a keyboard. This made for a powerful design that Atari quickly brought to the market. Besides its flaws, the system featured a number of innovations, such as the first automatic TV switch, which allowed it to automatically switch from regular TV viewing to the game system signal when the system was activated. The initial system release featured four controller ports, which no other competitor had at the time. The 5200 also featured a revolutionary new controller design with an analogue joystick, numeric keypad, two firing buttons on the sides of the controller, and game function keys for Start, Select, and Reset. The unusual design of the joystick, however, proved to be unreliable, turning off many users (the joystick used a very weak rubber boot to provide centering instead of usual springs). Another problem with the system was its software incompatibility with the Atari 2600, although an adapter was released in 1983 which allowed the 5200 to play all Atari 2600 games, using the more reliable and native 2600 controllers. Atari also gave the 5200 little attention as they focused more on the Atari 2600's popularity. The already rising controller problems, economy issues, and competition from the ColecoVision eventually led to the system's demise during the video game crash of 1983. Pages in category "Atari 5200"
This page was last edited on 26 April 2015, at 02:11. This page has been accessed 13,990 times.